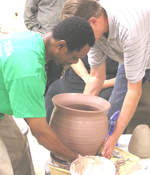 Students at Rusty Kiln were treated to a demonstration by master potter Ernest Aryee, a sales and customer service rep from Nidec-Shimpo America Corporation. 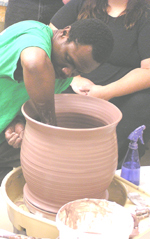 Ernst demonstrated the throwing of a large pot in a West Africa style. It is thrown without a bottom. 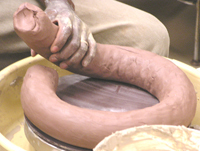 Traditionally, a curved bottom would get added later. 1. 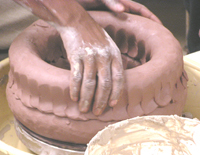 Ernest began by splitting a 25 pound block of clay and rolling each half into a large coil. 2. The coil was then placed on the wheel. 3. Only a small amount of water, sprayed from a sprayer, was used. 4. The second coil was then placed on top of the first. Downward pressure and pushing the top coil down to connect with the bottom coil assured a good connection and not air bubbles. 5. The coils were then pulled into a thick cylindar. Very little water was used. If you look closely at the pictures you see that only a small amount of water is in the drip tray. Note: The bottom is applied later. 6. A third, smaller coil was then attached to the top of the cylindar in the same fashion as the second coil. 7. The second coil was then placed on top of the first. Downward pressure and pushing the top coil down to connect with the bottom coil assured a good connection and not air bubbles. 8. Downward pressure and pushing the top coil down to connect with the bottom cylindar assured a good connection and not air bubbles. 9. The last coil is manipulated to become a permanent part of the earlier stages. 10. 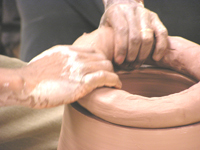 The large pot was completely formed with little water. 11. It took 2 to lift it off the wheel.